We’re nearing the end of the year and what a great year it was for manga! The early December snow seems to bring out the kids in us, and so does this box. CHILDREN was the theme for the month, featuring manga with child & adolescent protagonist, and colorful, playful snacks that resemble toys. The youthful crate was packed by Maid Penny-chan, a “maid-in-training” at Manga Spice Cafe. For those who don’t know, Manga Spice Cafe is a monthly subscription box for manga fans, which bases its care package on actual Japanese manga cafes, where you can rent a booth with a cozy couch, grab some snacks, hot meals, and drinks and choose from a selection of manga. Here, Manga Spice Cafe makes it easy to try out a manga cafe for yourself in the comfort of your own home. And it also includes the added experience of a maid cafe, as an adorable maid character greets you on the cover of every info sheet you receive in the box. 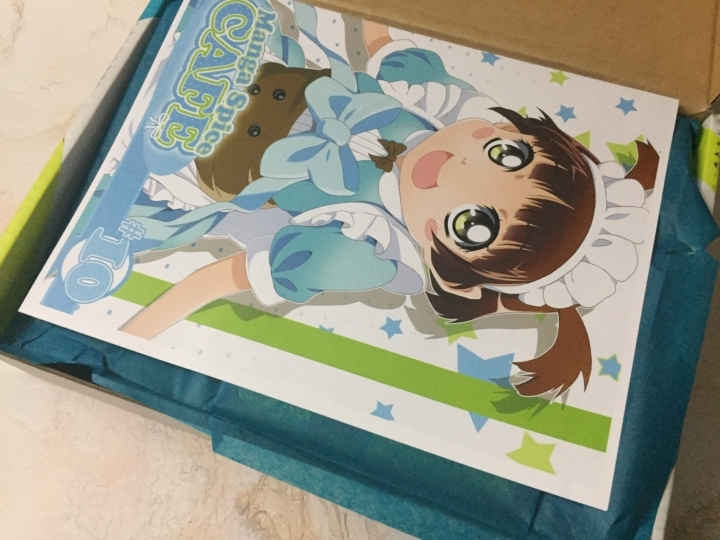 As always, the maid character is the first thing you see upon opening the box. How sweet! 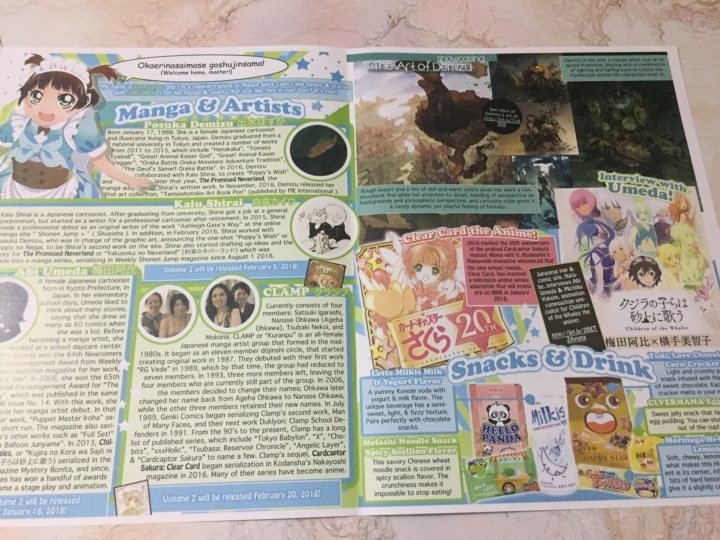 Penny-chan is on the cover of the info sheet. Some may find Demizu’s style a bit loose and unpolished, but her style fits beautifully with the dark undertones of this suspenseful story. We joined the orphans on a tale of survival as what seemed to be heaven on earth, turned into a never-ending nightmare. Orphans being sacrificed to appease demons?! Even though this story is part of the line up in the famous Shonen Jump magazine, it has a plot very different and unique to the typical shonen manga stories of heroes trying to become stronger. These characters not only have to be strong but smart in order to survive, and this story is a real page-turner. We enjoyed this book greatly, with a cup of creamy flan-like egg jelly from the Clevermama brand, and a semi-sweet, smooth, and fizzy can of Milkis, refreshing milk and yogurt flavor. Volume 2 will be released February 2018! “In an endless sea of sand drifts the Mud Whale, a floating island city of clay and magic. In its chambers a small community clings to survival, cut off from its own history by the shadows of the past. Children of the Whales is a lovely manga inside and out. We were surprised by the detail on just the cover! The designs are beveled to the touch (which is a nice decision on the publisher’s end). The artwork within the book is stunning. Admittedly, the story gets off to a slow start in book 1, but there’s so much beauty to look at, it makes for a relaxing read while munching on a Mofashi scallion-flavored noodle snack. No, you don’t cook these noodles, you eat them dry! They pair perfectly with the idea of the dry sands of Children of the Whales (LOL). The book does leave you with a cliffhanger which I’m sure will unfold the deeper mysteries of the story in volume 2. Volume 2 will be released January 16, 2018! Okay, so we know. They aren’t children anymore like in the previous series, but the youthfully nostalgic essence of it remains. And wow! Seventeen years after the original Cardcaptor Sakura manga ended, CLAMP returns with more magical clow card adventures! How beautiful is this book? Every page is rendered with exquisite shojo-style detail. Gentle pen strokes, creative use of screentones, we already feel like we’re watching an anime play out in manga-form right before our eyes. Clear Card is a great re-entry into the Cardcaptor Sakura universe and we’re extremely happy to find it in this month’s box. We enjoyed this volume with a box of hello panda cookies filled with strawberry creme! We also couldn’t stop eating these lemon hi chew taffies, which were unique in that they had crunchy candy bits in each center! Volume 2 releases February 20, 2018! Great choices this time, Penny-chan! Your training has paid off, and we highly recommend she be promoted right away to head maid! Seriously though, this box was fun and well balanced. You had something sweet, something savory, a little tangy, a little fruity, and to top it all off, a can of super delicious Milkis which blew us away. Who ever though milk and yogurt could be refreshing? The books were a great mix as well, with a bit of shonen action, a bit of lovely shojo, and an adventure manga in between. You should definitely consider this box if you are interested in manga but don’t know what titles to start with. There’s a manga in here for every fan! Want to have your own manga cafe experience like this at your doorstep each month? Subscribe at Manga Spice Cafe now! You won’t regret it!